Monterrey, Nuevo Leon in Mexico is a part of the Logistics Plus® network. This office provides LTL and truckload brokerage, air and ocean freight forwarding, warehousing and distribution, project cargo, import/export, and global trade compliance services. 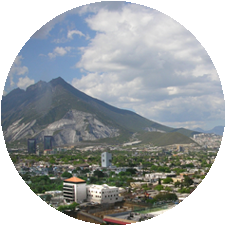 Monterrey is the capital of the northeastern state of Nuevo Leon and was founded in 1596. Its extensive network of roadways connects the city with the US border, the coast, and the interior of Mexico. In fact, the Monterrey-Saltillo-Matehuala-Mexico City Highway is the main roadway to the rest of Mexico. Not only is Monterrey home to two international airports–General Mariano Escobedo International Airport and Del Norte International Airport, but five airlines are headquartered there as well. In addition, there are three railway lines–the Nuevo Laredo-Mexico City, the Monterrey-Tampico, and the Monterrey-Pacific (Mazatlan). Monterrey is also home to a Logistics Plus office where we proudly serve both small and large businesses throughout the region. If you’re located in Monterrey, or any other surrounding community, your friends at Logistics Plus are ready to provide you with local, domestic, and global transportation and logistics services. Additionally, we’ll show you how our people in Mexico put the “plus” in Logistics Plus by doing the big things properly, and the countless little things, that together ensure complete customer satisfaction and success! Col. Santa Engracia, San Pedro Garza García, N.L.